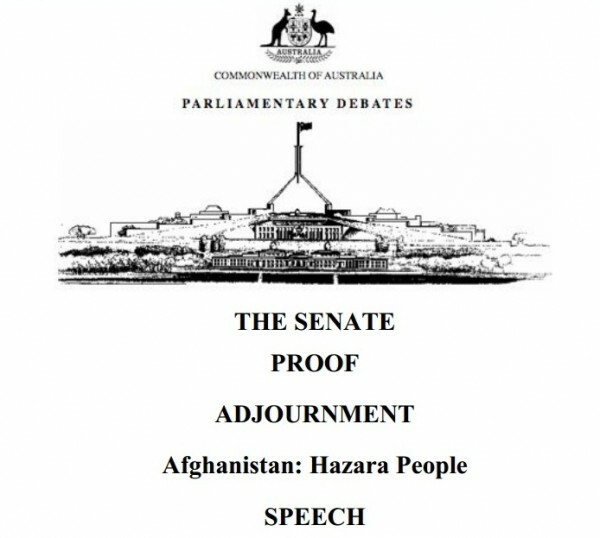 Senator BOYCE (Queensland) (19:26): In the world of refugees there are many deserving causes, but perhaps none more than that of the Hazara people of Afghanistan, who, through no fault of their own, survive persecution to become refugees. It is hard in Australia to imagine the plight of many displaced and persecuted peoples, but the plight of the Hazara people is one of the worst. The Hazaras are perhaps the best educated of all Afghan tribes, and they are—for their sins!—marked people. They have the distinctive Mongolian facial features that mean they are easily made a target of hatred. I am aware of the dire situation facing the Hazara people through two cases that have been brought to me: a young Hazara asylum seeker, Sayed Hussain Balkhi, who is presently in community detention in Brisbane and who is 17, and also the family of Zaher Alawi, refugees who arrived here in 2007, who are now permanent residents and who are now seeking to sponsor other family members to come to Australia. I will be talking soon about the stories of Sayed Hussain Balkhi and the Alawi family. But first I want to set the scene, for people who are unaware of the terrible crimes that have been committed against the Hazara people. Thousands of Hazaras have fled their homelands in western Afghanistan in the last two decades—and even more have died in Afghanistan and Pakistan, killed by their neighbours and by fellow Muslims. As an educated elite in Afghanistan, they have often found themselves the victims of discrimination and persecution—even of ethnically and religiously targeted assassinations. As Shiite Muslims they have been especially targeted by the Sunni Taliban. They have been accused of being collaborators in the service of the so-called NATO invaders, been denied the right to education—mosque burnings, bombings, targeted assassinations and beheadings have been commonplace. I want especially to come to Hussein Balkhi’s story shortly, because I am both shocked and hurt by the fact that our Department of Immigration and Citizenship believe he has nothing to fear by being returned to Afghanistan, despite the picture that I have just painted. In August 1998 in Mazar-e Sharif the Taliban massacred more than 2,000 Hazara in just three days. Many were simply shot in the streets or in their homes; 30 were shot in their hospital beds; some were boiled to death in sealed steel containers. Other residents were told not to touch the bodies lying in the street or they too would be killed. These are horrible stories that must be told, as it seems this government and its Department of Immigration and Citizenship think that many Hazara are not legitimate refugees fleeing death and discrimination and that somehow Afghanistan and the west of Pakistan are safe and secure places for the Hazara people to be. It was claimed by this government in a media release on 9 April 2010 that, after the fall of the Taliban, ‘durable security and constitutional and legal reform were serving to protect minority rights in Afghanistan.’ Such claims were wrong then, and they are wrong now. Thousands of Hazara Shiites have been persecuted and murdered. The Department of Immigration and Citizenship, quite reasonably, asks our embassy in Kabul for reports on security and sectarian strife. But the reports I have had from people who spend time on the ground in Afghanistan helping refugees are that the embassy staff in fact have little opportunity to get into rural, remote and far-flung Afghanistan and that they do not know all the facts. Human Rights Watch says that the killing of Hazara Shiites is ‘significantly under-reported’. The government and their officers have also seemingly accepted the advice of an unnamed representative of the United Nations Human Rights Commission, who claimed that since the fall of the Taliban the Hazara were experiencing a ‘golden age’. Decapitation is hardly ‘golden’, nor is becoming a homeless refugee. Many Hazara who have sought sanctuary here come from the Ghazni province, 120 kilometres south-west of Kabul. In June 2011 The International Crisis group described the province as the third-most volatile in all Afghanistan, just behind Helmand and Kandahar. Hazara in Ghazni have been killed, disappeared, forced to flee and had their ancestral lands confiscated. But they are not safe anywhere in Afghanistan. As I said before, they have been accused of being collaborators with NATO; they are denied the right to education. Even outside of Afghanistan, in Quetta, in West Pakistan, there is no refugee for them. Over half a million Hazara have sought refuge in and around the city of Quetta, in Western Pakistan. There, they are being attacked with increasing frequency. Their businesses have been bombed, their cars attacked and, in April this year, a bus carrying Hazara returning from a pilgrimage was bombed, killing 50 people. The bus service that links the two Hazara enclaves in Quetta, Brewry and the Hazara Society enclave, has now been stopped after it was regularly attacked, Hazara taken off the bus and killed on the spot. It is a 20-minute drive between the enclaves of Brewry and the Hazara Society enclave. People have told me today about the problems faced by Hazara, who joke about a ‘bribe or bullet’ system—you pay the bribe or you get killed. Those still in Quetta are even too afraid to even drive to the airport, where the office of the UNHCR lies, because they fear being recognised and butchered. I am told that the UNHCR office has a sign warning Hazara not to come there as it is too dangerous. Where do you go when the United Nations High Commission for Refugees is too dangerous? Hazara students come from a people who are proud to be well-educated, but the bus service that took Hazara students to university studies in Quetta has been terminated also after young Hazara students were hauled off the bus and killed. I would now like to speak briefly about Hussein Balkhi’s family and why he is here. Hussein is 17; he is now in community detention in Brisbane—he is basically alone. His uncle and grandfather were killed by the Taliban in Ghanzi. His father was shot dead in the street as he went to work, and yet we continue to be told by the Department of Immigration and Citizenship that it is safe for people to return to Afghanistan. In September the Director of the Asia-Pacific College of Diplomacy at the ANU, William Maley, said ‘there is little reason to be confident the general situation in Afghanistan will take a turn for the better in the foreseeable future. Hussein came here because his mother sold her entire dowry to get enough money for him to make that very perilous boat trip. What are you thinking when you put your eldest son on a boat because it is a better option than what is being provided at home? How bad do things have to be? Hussein was told he could not go back to Afghanistan or Uruzgan because his family name is on a Taliban death list. And yet, amazingly enough, this government in three days managed to refuse his application for citizenship. I am appalled. Thank you.